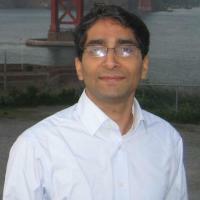 Dr. Mukesh Kumar is an Assistant Professor in the Nicholas School of Environment. He earned his B.Tech in Civil Engineering from Indian Institute of Technology, Kanpur and his PhD in Civil Engineering from Penn State University. His research interests lie in Watershed Hydrology, Groundwater-Surface Water-Atmosphere Interactions, Numerical Modeling of Snow and Hydrologic Processes, GIS-Model Coupling, High Performance Computing Applications and Optimization Methods. Wang, D; Liu, Y; Kumar, M, Using nested discretization for a detailed yet computationally efficient simulation of local hydrology in a distributed hydrologic model., Scientific Reports, vol 8 no. 1 (2018) [10.1038/s41598-018-24122-7] [abs]. Liu, Y; Parolari, AJ; Kumar, M; Huang, C-W; Katul, GG; Porporato, A, Increasing atmospheric humidity and CO2 concentration alleviate forest mortality risk., Proceedings of the National Academy of Sciences of the United States of America, vol 114 no. 37 (2017), pp. 9918-9923 [10.1073/pnas.1704811114] [abs]. Zi, T; Kumar, M; Kiely, G; Lewis, C; Albertson, J, Simulating the spatio-temporal dynamics of soil erosion, deposition, and yield using a coupled sediment dynamics and 3D distributed hydrologic model, Environmental Modelling & Software, vol 83 (2016), pp. 310-325 [10.1016/j.envsoft.2016.06.004] [abs]. Liu, Y; Kumar, M, Role of meteorological controls on interannual variations in wet-period characteristics of wetlands, Water Resources Research, vol 52 no. 7 (2016), pp. 5056-5074 [10.1002/2015WR018493] [abs]. Wang, R; Kumar, M; Link, TE, Potential trends in snowmelt-generated peak streamflows in a warming climate, Geophysical Research Letters, vol 43 no. 10 (2016), pp. 5052-5059 [10.1002/2016GL068935] [abs].